The village of Burley was centred on a small chapel, which was part of the parish of Otley. Near it was a corn mill on the riverside powered by a water wheel driven by the damming of a small stream from the moors. A manor house (Burley Hall), a smithy and an inn (formerly The Malt Shovel, later Cutlers Bar & Brasserie) were the other main buildings. It lay on the route from Skipton to Otley, the nearest market towns. Before the 18th century the village had grown away from the central core to the west along that route, now called Main Street. There were farm houses and their adjoining barns and cottages as well as other houses. Several are 17th century in origin, like Dial House, dated 1690, and are still in occupation. Elsewhere in the township were scattered farms stretching up to the moors. Cotton mills were established alongside a small canal (goit) taking water from the Wharfe in the 1790s and this led to the development of an industrial village in the nineteenth century. In the 1830s nearly 400 operatives worked in these mills. 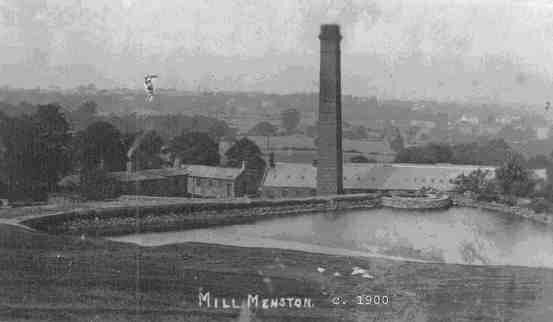 Later after William Fison and William Edward Forster took over ownership of Greenholme Mills in 1850, the mills were extended and worsted yarn and cloth became the main products. There was employment for over 700 workers in the later nineteenth century, when the population reached 3000. _Smaller textile mills were also established at Woodhead, but employment was limited and all except for the Bleach Mill failed long before the end of the nineteenth century. In the twentieth century the textile industry suffered from reduction in markets and investment. By the mid-1960s all local mills were disused but small businesses mainly of a sales or service nature have more recently located themselves in the old mill buildings. Much of the village character derives from the early settlement and its development in the 19th century, which established the streets, and buildings that lie within the Conservation Area. Transport was improved in the mid–nineteenth century when two companies built railways through Wharfedale. Apart from helping the movement of goods in and out of the village, they began to attract commuters to live in Burley while holding jobs in the West Riding conurbation. Regular bus services through the village in the twentieth century and the decline of employment in the mills turned the village into a dormitory.